There’s about 50 symbols included or you can add your own.. they can be colored, stretched, flipped, scaled and positioned wherever you want them on the screen. There’s entrance and exit animations..and you can add sounds to events. In addition to “random” images you can also show text or icons on the screen.. and you can also incorporate timers. Auras can be configured for individual toons.. or you can setup auras for all your toons. Auras can also be chained together so they fire in very specific complex circumstances. Let’s say I’ve decided that I want to show an aura when my character does not have the “Well Fed” buff. This is something I want on all of my toons. Type “/powa” to open the config screen on the left. Because I want this on all of my toons I’ll choose “Global 1” (if I already had 24 global auras I’d choose Global 2)(If it was an aura -only- for this toon I’d instead chose “Page 1” under Character effects) and then click “New” (or “Edit”). This will open the second setup screen. On this setup screen you choose what symbol you want to show up, what color it should be, where it should show, how big it should be. At the bottom on the “Activation” tab you specify when you want this symbol to show. “Well Fed” is a buff so I choose “buff” from the drop down. The name of the buff is “Well Fed” so I typed that in the text box. Below that, I choose “ignore uppercase” … I think it was a default I didn’t really change it. Most importantly, I choose “Show when not active”. That is, “if I don’t have the ‘well fed’ buff on me, show the symbol I setup above.”. 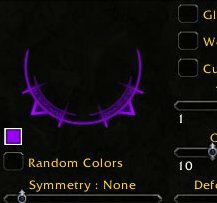 You can use the animation and sound tabs to add entry/exit animations to the symbol and to have the addon make a sound when the symbol shows up/leaves. In addition to simple auras you can also chain auras together so that the trigger in very specific circumstances. On my hunter, I want to show a symbol on my screen if my mana is below 50% and I -don’t- have Aspect of the Viper up. Because of the way the addon structures the auras I need to build these as two separate auras and then link them together. First I build the aura for “when I don’t have Aspect of the Viper up” (click screenshot to see details). For this aura it doesn’t matter what symbol I pick because the symbol for this aura is never going to show. I’m just using this aura to hold the logic. So, I create this aura, save it, note the aura number (this one is #6. See it on the tooltip.) and then shift-click it to turn it “off”. That is, it won’t actually fire.. but my second aura can use the logic from this first one. Now I will create my second aura. This one fires “when my mana is below 50%”. In addition to the basic settings I also put the number for the first aura (6) into the box to the right of the “exact name” checkbox. You can chain more than two auras together by comma separating the aura numbers in this box. In order for this second aura to display, both aura #6 and this aura must be true. So, if my hunter is below 50% mana.. and not using Aspect of the Viper a big blue drop will show up on my screen to remind me to change aspects. I have another set of chained auras setup if I -am- using Aspect of the Viper and my mana is at or above 98% to remind me to change out of Aspect of the Viper. Show symbol when I don’t have “well fed” buff. Show symbol when I’m in combat and any pally in my party has “Crusader Aura” up. (it’s a buff on me.. so I can treat it like a buff)(allows me to remind them/myself to change pally aura). Show symbol when I don’t have Fel Armor up. Show symbol when I don’t have “frost wyrm” flask. Show symbol when I’m in combat and at 100% health AND my mana is at 80%. (to remind me on my warlock to lifetap a little). Show symbol when I’m at 50% mana and I don’t have Aspect of the Viper up. Show symbol when I’m at 98% mana and I do have Aspect of the Viper up. Show symbol when my pet’s health is below 50% AND “mend pet” is available to be cast. Show symbol when I don’t have “Seal of” up on myself. Show symbol when I don’t have my “Aura” up on myself (reminder to put up an Aura). When I’m tanking, show symbol when I don’t have “Righteous Fury” up. When I’m healing, show symbol when .. um that thing procs that give me a free flash of light. When I’m Ret, show symbol when Art of War procs (reminder for free flash/exorcism). I’m using a fan update of Power Auras that allows me to restrict my auras by which spec I’m in. Here’s a screenshot with 3 auras showing. 3. orange spark on the right-hand side above my mini map telling me that I do not currently have druid buffs. Since there isn’t a druid in the party that makes sense. This just proves to me that I really need to get PowerAura’s installed and configured. I was recently provided this script to use PowerAura to watch the chat window for the word interrupt when the last person..
For those unlucky few that have to do interrupt rotations on fights like Vezax, here’s a little trick I use to get power auras to display a big flashing green “SILENCE” when it is my turn in the rotation. I just thought I would post it in case someone else found this trick useful. I’d need to fiddle with it.. but it looks like this snippet of code is counting on the rest of your raiders to say or emote “I interrupted” when the do their interrupt. Also, I think “Mayu” is the name of the person “before” me.. the one who’s interrupt I’m supposed to follow. This might be better if you updated it to my focus.. or something like that. Still, V. interesting. I’ll need to play with this. I wonder if this could be changed to make noises when achievements pop up. Hmmmm. Nice article. I’ve started using Power Auras for my Rogue combo points/SnD timer etc. So handy. Just a question, in the last (lotsofauras) screenshot what addon are you using for combat damage? I’ve seen it a few places and like the look of it. It took me a while to get into Powerauras (initially daunted by the interface and a bit lazy!) but now I can’t get by without it. I play a Hunter and have it set up to display whenever my shots are ready plus an invaluable one that shows when both my trinkets proc and Rapid Fire is ready for a blast of uber firepower. It can be worthwhile setting it up for individual fights too, eg showing you when you have the Toasty Fire buff in the Thorim fight. Yes, I would like to know what that add on is as well, where it shows you the 2 green bars beside you. They read, 23940(100%) and the other bar next to it reads 19744(100%). Could you please tell me what that add on is? Hmm.. I’ve never noted it as a memory hog. I’ll have to look at the actual footprint tonight. Yea, whats that add on next to you with those 1 green bars? Thanks for this. I’ve used Power Auras on my priest and mage for a while — letting me know when abilities proc. It’s great. I’ve used it minimally so far on my warlock but now you’ve given me some additional good ideas for it. I’ve been toying with the idea of installing power auras for a long time but I think your article will finally motivate me to give it a try. I’ve used Mik’s Scrolling Battle Text to handle triggers for things like a boss being at 25% or my (glyph of) life tap buff falling off but I will try using Power Auras to display both, as well as nightfall procs. Also can this hook into Omen to, for instance, flash a red aura when I pass threat on the tank and then a more vibrant one when I actually pull aggro? Look forward to tinkering with this. The answer is probably yes.. assuming you want to fiddle with the .lua.. but off-hand I don’t know how to do it. Omen itself has visual warnings.. you might check it out. Oh I didn’t know about chaining aura’s … very nice thanks. .-= Bobturkey´s last blog ..T9 priest sets take two =-. .-= Grimtorn´s last blog ..Gearing your Unholy DK for Naxx: Part 5 =-. I’ll see what I can do about pulling them out for you.. but keep in mind, my hunter has -just- turned 59.. so her auras aren’t setup for raiding. My personal theory of power auras is I want my screen to be clear of auras. So I setup auras that tell me to trigger something that will make the aura disappear from my screen. Megasmack seems to have a different theory.. there are alot of auras on his/her screen that never really seem to go away.. so MMV. http://www.plusheal.com/viewtopic.php?f=8&t=3413&start=20&st=0&sk=t&sd=a There are many nice auras there. i still dont understand why use Power Auras when Miks Scrolling Combat Text does everything PA does, with less use of screen real estate, with less setup… am i missing something? I’ve never setup Mik’s to do this kind of thing. How would you do it? I use both Power Auras and Miks because, while I can often construct a similiar trigger for Miks, I might miss the message/sound in the chaos of the moment. For instance I have Miks set up to play a submarine diving horn (no idea why that’s a standard sample but hey, it works) when the target mob is at 25% or less health. It also flashes in large letters “Drain Soul!”. The audio/visual cue is great but just in case I also have Power Auras set up to display a large skull and crossbones underneath my character for the same conditions. Another example where this sort of redundancy is helpful is tracking a longer cooldown (Curse of Doom for instance), mana/health, or Nightfall procs.